The Drummer: "Who's the chick?" Drummer: "Well, your Cinderella has a gun about THIS big in her purse." Fred: "That's her magic wand." Few romantic caper films are quite as unusually stylized as Subway, a film that is very distinctly a Luc Besson project in its whole look and feel. While largelyflawed by the fact that it's never sure which story to tell, Subway is still anengaging and creative film that wins a lot of points just for those traits alone. Romance can be a tricky thing; either too sappy for most or not enough for others. Subway bypasses those problems by making the romantic aspect here almost surrealistic in nature. We have no comparison to judge it by because few romantic films are quite as chaotic and skewed. Set primarily in the Paris Metro, Subway introduces us to Fred (ChristopherLambert) and Helena (Isabelle Adjani), as strange a couple as there ever was. Fred,having recently just robbed Helena's home, is hiding out in the subways to avoid the police as well as the private security team that Helena's wealthy husband controls. Fred could earnestly care less about money, but he ransoms the valuable information he's obtained from Helena's safe just so he can keep seeing her. Unable to leave the subway, though, Fred finds himself in an unusual subterranean world inhabited by all sorts of unusual people. In the depths of the Metro, he finds a society of thieves, musicians, and other sorts, all hiding from something or another, but still finding themselves blissfully free of many of society's problems. Helena, anxious to rid herself of Fred, decides to pursue him into the depths of the subway and, along the way, discovers that maybe this unusual world is more to her taste than the high-class society she's used to. In the process, a whirlwind relationship of sorts begins between her and Fred, set amongst the chaos of living inside a subway station with a variety of mysterious personalities. Although much about Subway seems directly descended from the French "new wave" filmmaking style, it's anything but pretentious. Instead, Besson mixes his trademark, bold, widescreen visuals with a plot that in many ways makes very little sense and almost mocks itself. Subway could have been some kind of film-noir or taut thriller if it wanted to be, but instead, it's a comedy of errors, filled with human characters all the more charming because of their offbeat attitudes. Subway's central problem is that it often frustrates the viewer by abandoning certain subplots. 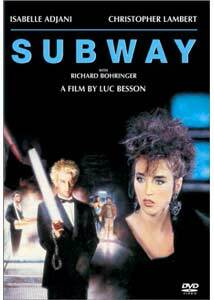 While enjoyable on the whole, Besson really should have focused the story on either the romance between Fred and Helena, or the story of Fred's life amongst the Subway people. Covering both so equally leads to a feeling of uncertainty about just what is happening. The romance aspect, though cute, is also pretty vague and paced extremely fast. Given that it's supposed to be a bit weird, this fits, but still throws many people off the concept. Story flaws aside, the cast is primarily the reason for the success of the film; Christopher Lambert and Isabelle Adjani taking most of the film on their shoulders very well. Familiar Besson film faces are also present: Jean Reno as the unknown drummer in Fred's weird underground band (literally), Jean-Hughes Anglade as the thieving Roller, Jean Bouise (Le DernierCombat) is the station master, and even composer Eric Serra makes an appearance as the bass guitarist in Fred's band. I think any fan of other offbeat, intensely stylish Besson films like The Big Blue or Nikita will find themselves at home here. It isn't perfect, but the willingness of the cast and crew to do something so fresh and interesting makes it a unique vision, much like a good deal of the director's work. Image Transfer Review: The VHS medium never saw a widescreen version of Subway, and the DVDmakes up for that disgrace with a lovely 2:35:1 image that restores all the wide angle shots and specific composition of the image frame. The transfer itself is gorgeous, looking virtually like a brand-new film with few source print defects and obvious attention paid to the constantly varying photography. While the image did seem a tad bit darker than the normal movie (you may need to bump the brightness setting up a notch or two), most details seems perfectly visible and sharp in the dark, subway catacombs. There didn't seem to be any over-sharpening problems and no compression artifacts. A few scenes exhibited some heavy grain, but nothing you wouldn't expect from an older film, and the transfer handles it well, without major shimmer or background movement. All in all, a stellar DVD. Audio Transfer Review: Thankfully, my soul wish for the Subway DVD—restoration of the original French audio track—has come true. On top of the original dialogue track being more fluid and natural, it also sounds pretty amazing for a film of its time. Again, it's almost like a new film, with a dynamic and amazingly immersive Dolby 2.0 soundtrack. Incredibly clean and clear, even the deep bass effects are handled with a style that smacks of current digital tracks. If one element explodes off the screen, though, it's Eric Serra's typically upbeat and jazzy score. I don't recall any significant surround channel usage, but the front soundstage is so expertly handled, it really doesn't need it. Of similar quality is the new remaster of the English dub for the originally released American version, which I've never personally cared for. While Christopher Lambert and Isabelle Adjani dubbed themselves(since they speak fluent English), the majority of the supporting cast is poorly substituted, and dialogue is often altered enough so as to obscure the original meanings of jokes and innuendos. Extras Review: There are trailers and brief filmographies for Luc Besson, Christopher Lambert, Isabelle Adjani, and Jean Reno, as well as subtitles (pure yellow). Though the menus are static and a bit boring, they at least show some stylistic effort. The meaty 28 chapter stops make for nice access to all portions of the movie. The insert contains chapter listings and a reproduction of the cover art, and speaking of, the new cover art is nicer than the old cover art. The original art was misleading, making Subway seem more serious than it actually is. I, like many Luc Besson fans, feared that the immense unpopularity of Subway might lead to a subpar DVD, but thankfully that isn't the case. Despite a lack of features, the quality transfer makes a nice package for collectors.